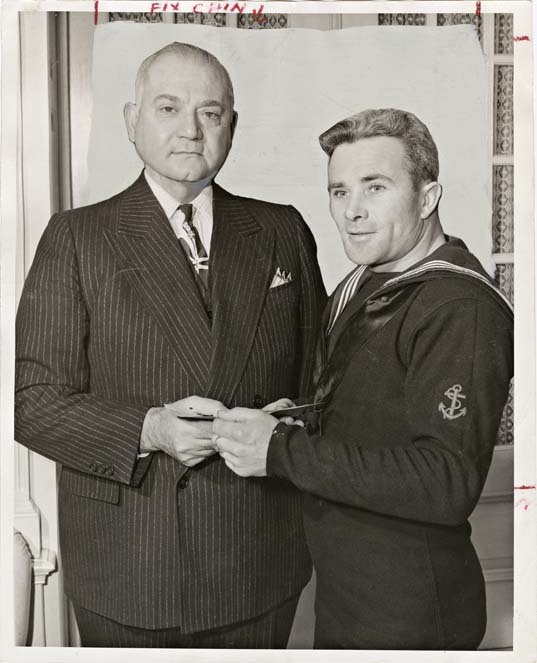 Black and white press photograph of James Franceschini posing with leading seaman Max Hurley. There is evidence of retouching in the photograph, along with instructions for the printer. During World War II Italian Canadian businessman James Franceschini was interned in Petawawa, ON. The original photo caption reads: James Franceschini is shown as he presented a cheque for $2,500 for his fourth successive million cigarettes for the Overseas League (Canada) Tobacco fund. Receiving the cheque on behalf of the servicemen is Leading Seaman Max Hurley, instructor at H.M.C.S. York and former famed six-day bike racer.